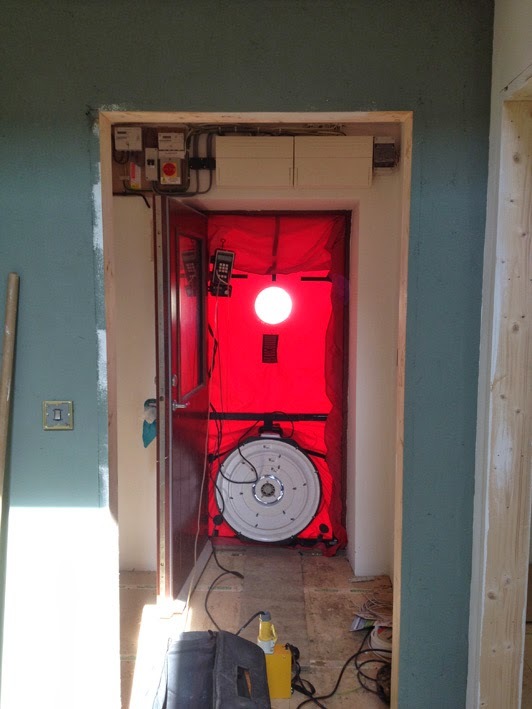 Today we had our first blower-door test, to measure the airtightness of the building. The more airtight a building - the more energy efficient. Any warm air leaking from a building is lost heat-energy. You can cram in all the insulation you like, but if there's a hole in it allowing air through and heat out, then it's a waste of time. Achieving a good air-test result is really important, so today was a mind-frazzling mix of excitement and tension and some frustration. The fan and measuring gear, sealed into the front door, ready for the airtest. To measure air leakage, ventilation openings (the heat-recovery vent ducts in our case) are sealed up, and all doors and windows are closed. A large fan is then sealed into the front door opening, the pressure inside and outside the building is measured, along with how much air the fan needs to remove from the building to maintain a set pressure (50 pascals, apparently). From this the air leakage into the building is calculated. Before this, the engineer carefully measured the inside of the building in order to calculate the area of "the building envelope" - the external walls, floors, and ceilings (aka. : the building...). The unit used to measure airtightness is cubic metres of air leakage per hour, per square metre of building envelope (m3/h/m2). Building regulations ask for a maximum of 10 m3/h/m2, The Energy Saving Trust's Best Practice standard is 3 m3/h/m2, for Passivhaus standard it's 0.5 m3/h/m2, and for enerPHit (Passivhaus standard for retrofit/renovation) the standard is 0.6 to 1 m3/h/m2. We were aiming for 1 m3/h/m2 but we're not there yet: the test gave 2.68 m3/h/m2, which is well within building regs, and within the Energy Saving Trust standard, but not as good we want. Unless we get the building tighter, we'll lose too much heat through ventilation, and there's a chance the heat-recovery ventilation may start to use more energy to operate than the amount it recovers. So it's a good start, but we're not done yet! It's a slightly frustrating result, but the test has shown me exactly where I need to seal things up more. Some of these were expected, some less so. Air is leaking in where the cables enter the light switch and electric socket back-boxes. The surprising thing is that these leaked more in the extension where I had used rubber sealing-grommets on all cable entries, and less in the refurb bungalow, where the sealing was just the plaster around the cables where they enter the boxes (the grommets are specifically designed for airtightness. Grr). Sealing these will be tedious but not hard - I just need to seal the cable entry to the boxes with silicone or similar. One of the more irritating air-leaks was in the fold-aside doors which were sold to us as airtight. The air-test engineer (the very helpful Sam from MSAFE) rates drafts from 1 (howling gale) to 3 (trickle). There are four points of these doors which he rated a 2. On inspection I found this was because there is a large break in the rubber airseal either side of each pivot point. This appears to be intentional, and is a very surprising design flaw. I will have to talk to the door suppliers about how we can resolve this. Another leak was the join between the bale walls of the extension (or the clay plaster on them) and the timber base the bales sit on. I'd sealed the join between the timber base where it sits on the brickwork, but had hoped the weight of the walls pushing down would seal the bales against the timber. I'm hoping this can be sealed with mastic/builders-caulk once the clay plaster has had it's first coat of paint. There were also leaks around where the water main and soil pipe entered the bathroom. The bathroom is in the centre of the building so this surprised me. Hopefully these leaks can be dealt with by sealing the floor covering to the walls and around the pipes. Finally, air found it's way through the cavity wall of the original bungalow and out around the bathroom window opening. This will get sealed up when I build the glass block wall here (the window now opens onto a corridor). So: an eye-opening day, some frustration, we're not where we need to be yet - but by 'standard' construction standards we got a very good result, and now know how to improve it further. 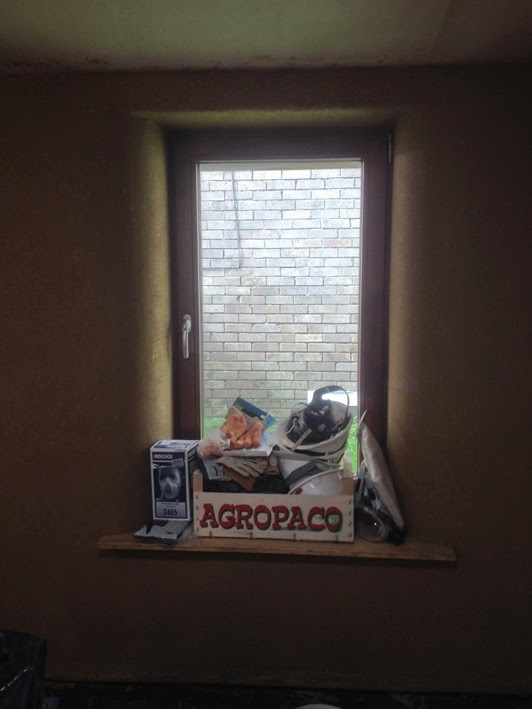 For more info on what we've already done to try and keep the building airtight, there's a few posts here, under the 'airtightness' label: http://thewoodlouse.blogspot.co.uk/search/label/airtightness. It is good to see you have gone the extra mile as to have the pressure test done and finish the little bits because that's what really makes the difference. And 2.68 m3/h/m2 is not such a bad result for self-build so well done to you Sir! Thanks! :-) I'm feeling more confident today about getting the extra bits sealed up.